With its uniquely Scandinavian blends of cosmopolitan culture and natural beauty, old-world charm and modern infrastructure, Stockholm easily stands out as one of my favorite European destinations. Whether I’m looking to get lost in the maze of centuries-old streets, rub elbows with black-clad urbanites or cruise along the sparkling waterways, Stockholm delivers. But if you’re a fan of Italian, Spanish, Greek or other well-loved European cuisines, you might be wondering what’s on offer in Stockholm, especially for gluten-free diners. From classic Swedish meatballs and princess cakes to hearty plant-based dishes and fika treats for every palate, join me on a mouthwatering gluten-free tour of the capital of Scandinavia. To get a taste of Stockholm in the 17th century, head straight for Old Town, or Gamla Stan. 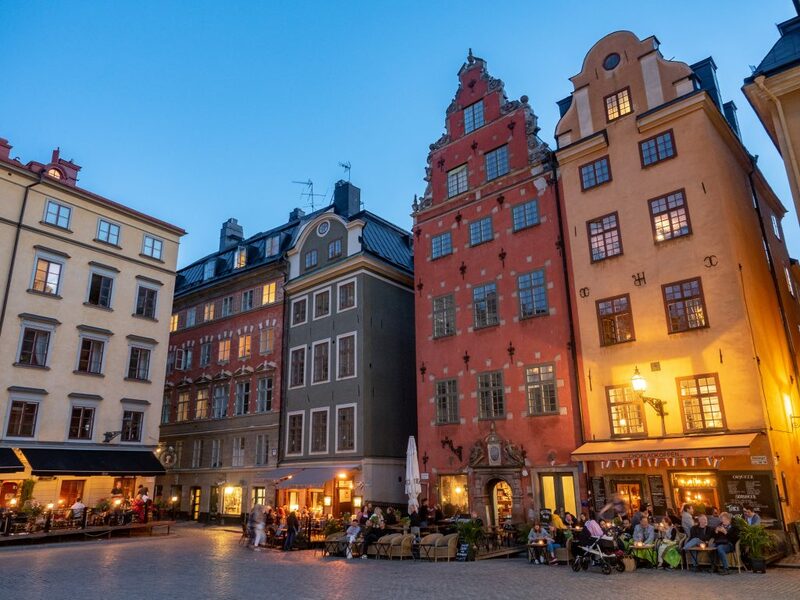 Nestled on Stadsholmen, an island in the center of the city, Gamla Stan features a network of narrow lanes lined with historic ochre- and rust-colored homes, shops and landmarks. You’ll find plenty to catch your eye along main routes like Stora Nygatan and Präsgatan, but be sure to venture onto the tiny side streets for the cutest shops and the best photo opportunities. Whether you opt to visit Gamla Stan highlights like the Royal Palace, King Carl XVI Gustaf’s official residence, or the Nobel Museum, which has exhibits about the Nobel Prize, or you just want to take in the area’s historic ambience, leave time to dine at Under Kastanjen (Under the Chestnut Tree). Tucked away under an ancient chestnut tree in a quiet pedestrian area, this restaurant is an essential stop for gluten-free visitors to Stockholm. This cozy spot easily caters to regular diners and those with gluten-free needs, as it has two separate preparation areas. One of Under Kastanjen’s bakeries is completely gluten free, so you can indulge in both sweet and savory treats without worry. Of course, you can’t have a meal here without sampling the gluten-free Swedish meatballs with all the trimmings. 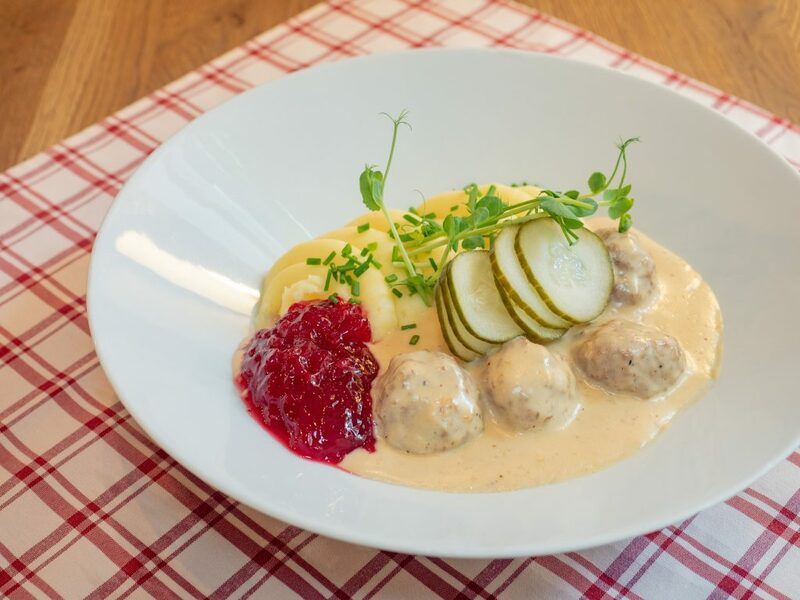 The nicely seasoned meatballs pair perfectly with the wonderfully creamy gravy, lightly whipped mashed potatoes, tart lingonberries and crunchy pickles. Be sure to arrive hungry or plan to share, as this hearty dish will fuel you for hours. Not feeling the meatballs or looking for a little more variety? Warm up with the daily soup or enjoy a sweet treat in the afternoon instead. Fika, a daily cookie and coffee break, is an institution in Sweden, and Under Kastanjen is the ideal spot to wash down a pastry or two with a strong cup of coffee. After touring Stockholm’s Old Town, step back into the present with a spin through Östermalm, the city’s modern and upscale east side. Here, you’ll want to stroll along Strandvägen, the waterfront promenade, before heading indoors to the Swedish History Museum. You could easily spend a day in this sprawling building, tracing thousands of years of history, learning about Viking mythology, and marveling at the glistening gold room. Exploring museums always helps me work up an appetite, so after you’ve had your fill of Swedish history, I recommend walking a few blocks northwest to Ecoist. 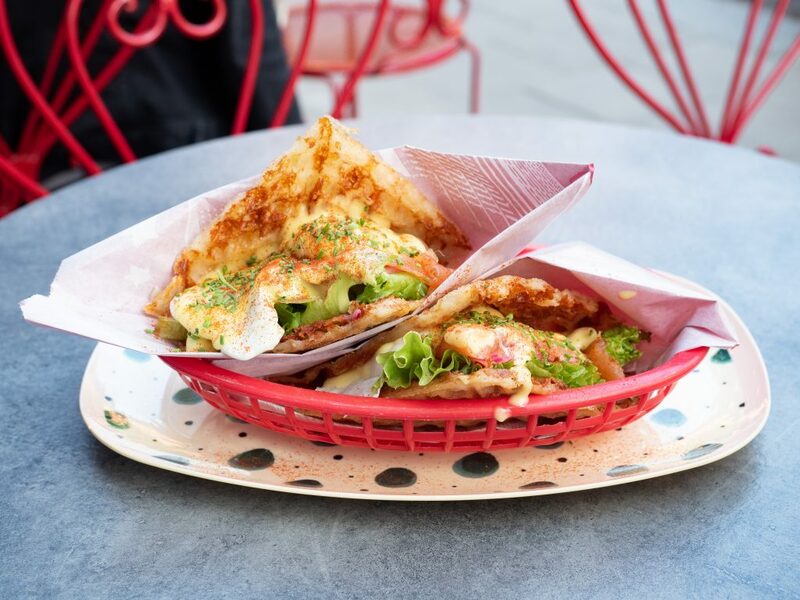 Located on one of Östermalm’s buzzy side streets, this small café is a gluten-free and organic oasis that’s always serving up something delicious. This spot serves breakfast and lunch, and I found that by arriving between the two meals, I got to sample the best of both. Note that Ecoist doesn’t publish its menu in English, but the staff can easily translate the daily specials and answer any questions about gluten-free preparation. For breakfast, I recommend the buckwheat porridge. This nutritious grain bowl comes packed with cinnamon and apples and topped with dried coconut and almond milk. 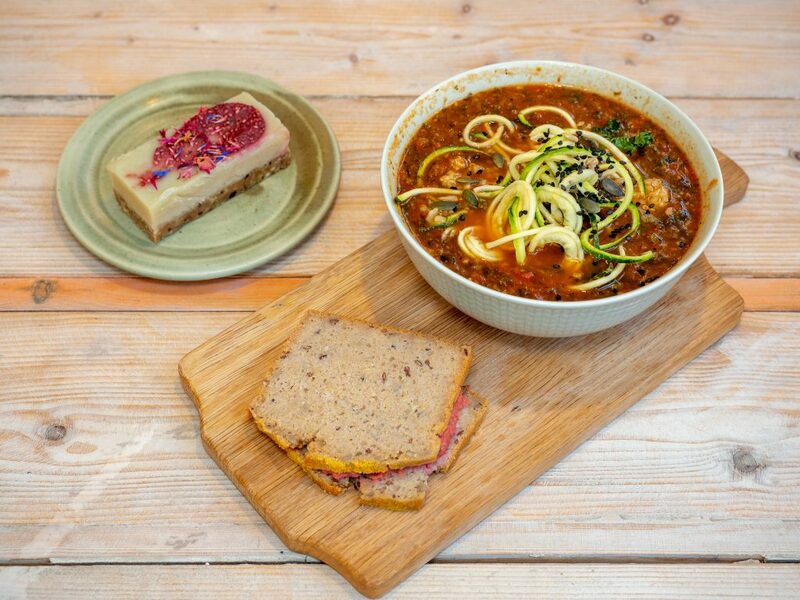 For lunch, you can’t go wrong with the daily soup. Loaded with herbs and quinoa, the flavorful Mediterranean soup with a side of gluten-free bread and hummus makes for a tasty midday meal. Don’t leave without trying the sweets. I especially liked the raw rhubarb slice, a rich, nutty treat with a lovely touch of tart rhubarb on top. Next, venture over to Södermalm, Stockholm’s hip south side. Easily accessible by foot, subway or car from Östermalm or Gamla Stan, this neighborhood offers a vibrant mix of historic avenues and funky enclaves, with a little something for everyone. To take in the best views of the city, set your sights on Monteliusvägen. This pathway skirts the northern edge of the island and offers stunning vistas of highlights like Gamla Stan, Stockholm’s distinctive city hall, beautiful Lake Mälaren and much more, completely free of charge. While in Södermalm, take a few moments to admire the centuries-old homes before walking south toward the funky shops along Södermannagatan. After peeking into the vintage boutiques and browsing through the designer shops, satisfy your shopping-induced hunger near the lively Nytorget. No matter the time of day, I suggest heading to Älskade Traditioner (Beloved Traditions), a delightfully retro café that drew me inside with promises of gluten-free waffle sandwiches. Owner Susanna Comstedt designed the Wraffle, a waffle-wrap hybrid, as the star of the show at this 1950s-themed café. As she explained to me, the waffle iron gained popularity in Sweden in the 1950s, inspiring her to concoct a creative waffle-focused dish to tie the theme together. To welcome everyone to Älskade Traditioner, regardless of dietary needs, Susanna made a point of offering gluten-free and vegan versions of her signature Wraffles. Since the kitchen team uses a separate waffle iron for gluten-free Wraffles, you can order yours without hesitation. If you’re in the mood for a savory Wraffle, I recommend the gluten-free Eggs Royale, which comes with poached eggs, smoked salmon and a generous helping of hollandaise sauce. Rich and buttery, this waffle sandwich is big enough to share, especially if you’re also planning to dig into a sweet waffle topped with cloudberries, whipped cream or maple syrup. Exploring on foot is my favorite way to work off an indulgent meal, and Stockholm has plenty of parks for both casual strolls and more challenging hikes. You’ll find several smaller parks interspersed throughout the city’s many neighborhoods, but I recommend making a special trip to two of Stockholm’s best green spaces. Just east of Gamla Stan, Djurgården is an extensive island park and my preferred place to stretch my legs without leaving the city. Along with miles of walking paths, beautiful waterfront views and colorful gardens, this park is also home to over 20 museums. While Skansen is a good choice for kids and the Abba museum is ideal for music lovers, my top pick is the Vasa Museum. Here, you can see the reconstructed ship that sank off the shores of Stockholm in the 17th century and hear the mysterious stories of the shipbuilders and the crew. For even more fresh air, make your way to Haga Park, a Royal National City Park and home to lakes, forests, gardens and distinctive copper tents. These blue structures serve as more than a popular photo opportunity, however. They also house an outpost of Kea Bageri, a completely gluten-free bakery. At Värdshuset Koppartälten (The Inn at the Copper Tents), bakery owner Madeleine Olsson prepares an incredible range of gluten-free sandwiches and desserts. 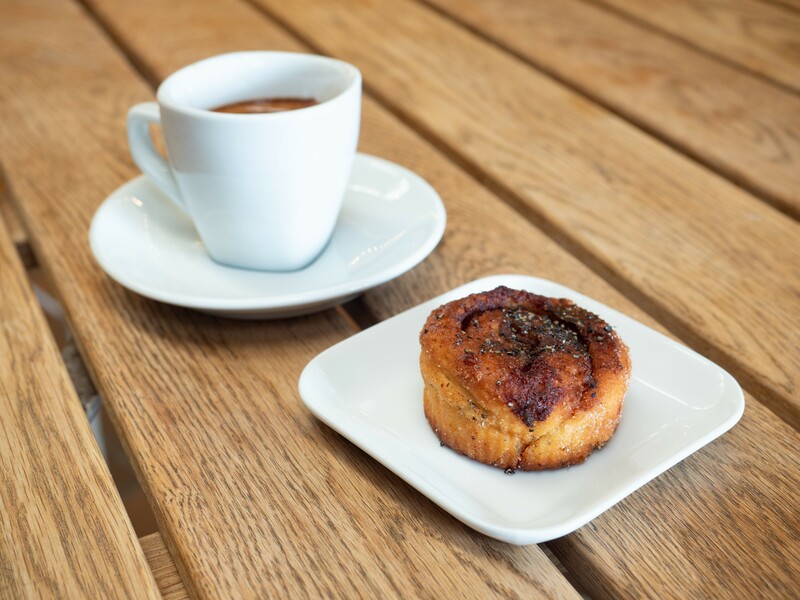 I opted to stick to the sweets during my visit, and I particularly liked the well-spiced apple cake and the warm cardamom bun, a classic Scandinavian treat. To try even more gluten-free goodies, make a trip to Kea Bageri’s main location in suburban Stockholm. Along with a full range of cookies and tarts, that’s where you’ll find gluten-free princess cake, a special Swedish dessert with royal origins featuring cream, jam and cake carefully encased in bright green fondant. If you’re visiting Stockholm when the sun is out and the weather is warm, set aside some time to get out on the water. Rivers, lakes and canals define the Stockholm region, and hopping on a boat is the perfect way to way to journey outside of the city limits. If you’re short on time, a one or two-hour tour of the harbor area can give you a whole new perspective on the city. If you have a little more time to spare, however, I recommend booking a ferry to one of the many islands that compose the Stockholm archipelago. From spring through fall, you can take multiple ferries each day to destinations like Vaxholm, an important 16th-century military outpost, and Grinda, a laid-back island popular with families. For the ultimate escape from the city, however, Sandhamn is my top pick. Located in the outer archipelago and at the edge of the Baltic Sea, this island is one of the area’s most remote and peaceful destinations. After a two-hour ferry ride, Sandhamn welcomes you with opportunities to hike through the ancient forest, soak up some sunshine on the deserted beach, and enjoy some of the freshest air you’ll find anywhere. While you can find some gluten-free options on the island, dining choices are very limited in such a faraway locale. I suggest doing what I did and packing some snacks from Stockholm’s gluten-free bakery Friends of Adam to keep you going. This bakery doesn’t have a storefront, but you’ll find its gluten-free bread, muffins, crackers and more at Coop supermarkets and Urban Deli markets throughout the city. Whether you want to explore centuries of fascinating history or soak up the cool metropolitan vibe, the capital of Sweden awaits. I can’t wait to return to experience more of Stockholm’s countless cultural attractions, easily accessible countryside, and deliciously diverse array of gluten-free goodies.